And THE Biggest Loser is…………..
Well, I can now reveal that the weight is finally over. The winner of the Ultramadness Wahey-In is ……………………. ME, Andy, with a loss of 8.85% of total starting body weight since our journey began in January. You, the public, have spoken and 63% of you said the Lakeland 50 weigh in scales should be used for the final weigh in. 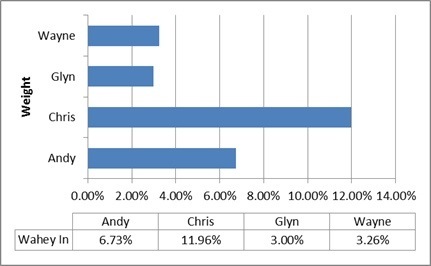 At one point Chris had what looked like an unassailable lead of over 4% but like Ultra Running weight loss is a pacing game. Wayne managed to sneak in with a leap over Glyn at the end who takes the wooden spoon! So now, we need a new challenge as we’ve a lot of races lined up. Glyn and I are competing in the Grand Tour of Skiddaw the 44 mile circular on August Bank Holiday weekend. Chris has the enormous challenge that is The Ring O Fire, the 131 mile Ultra to compete in which is being held at the end of August. This is then followed by the team competing at the 100km Ultimate Trails Ultra Marathon only a few weeks later mid September. Its then only 3 months until the Spine Challenge so we’ve a lot of work to do, especially following the rest of our performances last weekend! So if you’ve any ideas for a suitable challenge for the team to keep us motivated and pit ourselves against one another please let us know! Thanks for your interest so far and be sure to stay tuned for news, views and the odd muse over the next few weeks! The weight-in is finally over, or is it………..
Well, the Ultramadness weigh in has reached its finale, or has it??? The rules stated that we were to use the Lakeland 50 official weigh in as THE last weigh in of the competition and not the home scales we’d been using since the beginning of our challenge. Now this gave us a bit of a situation as our home scales are calibrated differently, on carpet, less clothes than at the 50 weigh in etc etc so may not replicate the ‘home’ weight we’ve been recording against. So what to do, well you decide!!! Well as luck would have it we have our first Ultramadness Family Funday (UMFFD) on the 1st August where we’re paying back some of the sacrifices our families make to allow us to not only take part in these amazing events but also the training, kit, the kit, the other kit, that other kit and of course THE essential kit that’s just been released etc etc. Its a small token of our appreciation to them all. So myself, Sarah and Isabelle along with Chris, Karen, Dan and Lauren plus Glyn, Kerry, Will and Ben and of course Wayne, Liz, Ally, Archie, Reece and Eleanor will meet on the shores of Consiton at an undisclosed location (for security) for a good family day out where no mention of running is allowed, well by the boys anyway. Oh yeah, plus Dibble, Molly, Jake and Joss the dogs!!! So how do you decide? Well here is a very simple poll, you choose which weigh in we use as to who wins the competition. We’ll take the votes at 10pm on Wednesday 31st July and reveal the winner then! 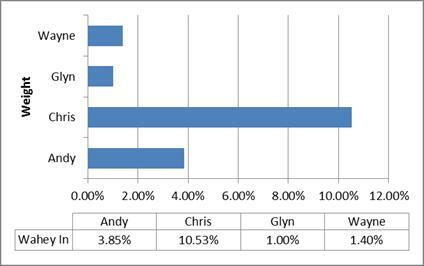 You’ll see that it was a 2 horse race at the sharp end but we’ve omitted the names of who was in which position. All you have to do is simply choose if we continue to use our home weigh in or the Lakeland 50 weigh in as per the rules. It’ll only take a second and if you can share amongst as many of your friends as possible to give a tru representation of the nation that would be much appreciated. Remember, its your voice, your votes count! Well we’ve only a couple more weigh ins to go and who’d have thought it would have been so close at the business end of the competition and those battling for the chocolate spoon at the other!!! So hows it gonna finish up, find out next week when the comptition (this time round) concludes at the Lakeland 50 registration weigh in! Well I’m a little late this week but the results are in and the gaps are closing again. Bigger gains on Chris could have been made this week as Chris has had another ‘large’ one to match his gains the week before. 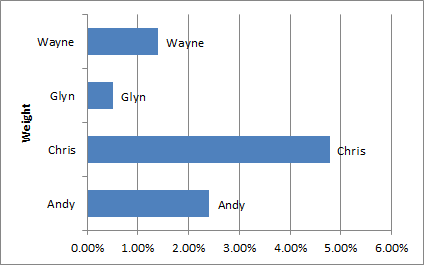 Wayne & Glyn maintain the status quo and I’ve added a couple but still made ground on Chris. Stay tuned for the latest as we start our taper for the Lakeland 50 & the final weigh in at the end of July!! Water water everywhere but not a drop to drink…..
Its a bit of an odd one this week. We’ve got a man down with a damaged ankle and three of us did arguably the biggest weekend of our training so far this year. So how is it the guy not training is the only one not to gain weight this week??? Well it may seem odd but actually it makes perfect sense. Wayne, Chris and I trashed ourselves this weekend with over 28 miles from Pooley Bridge to Ambleside on Saturday and Chris and I did another 15 miles from Ambleside to Consiton on Sunday. The ascent was over 3,000m, nearly 10,000ft, which means lots of descending too meaning smashed quads as well as other muscles. Up, down, over she goes! With all that activity comes DOMS, Delayed Onset Muscle Soreness, and your body/muscles swells with excess fluid and blood from those muscles being worked and in some cases damaged. Our muscles use glycogen (a water/glucose concoction in our muscles) for energy and when we work hard we deplete the glucose leaving behind just the water, which is very heavy. Some of this water is reused in the body and some is removed via sweat or urine. So the body needs more energy, produces more glycogen and even more water making us heavier! We also take on lots of water for hydration, likely before, certainly during and more so after the event. Water, whilst good for you, is also very heavy. 1ltr = 1kg!!! Now I’m sure I’ve not got this info 100% correct but it gives the general idea of why you’re generally heavier after exercise. Oh and that’s not mention all the goodies on offer at the Lakeland 50 recce checkpoints such as flap jack, jaffa cakes and Swiss bloody roll!!!! 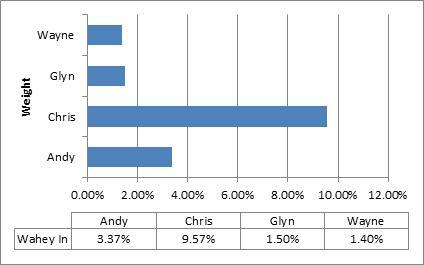 Chadders still leads the way and by doing nothing Glyns closed the gap on us all!! Stay tuned peeps, still a chance to catch him. Well this week saw much movement amongst the ultramadness crew, sadly 75% of the movement was in the wrong direction. Its not often im amongst the top 25%, certainly not in anything ultra but this week was to be the exception! I was able to post a larger than average loss this week closing the gap on Chadders who still remains out in front by a good 3+ %!!! As we’ve extended the date final weigh in we still have 5 weeks to go there’s still a (outside) chance one of us could catch him and its certainly all to play for amongst the remaining placings. With a big weekend ahead of us as we’ve a Lakeland 50 Double Recce planned. This covers virtually the whole of the 50 route over two days and starts early Saturday morning at Pooley Bridge finishing in Ambleside which totals around 32 or so miles. 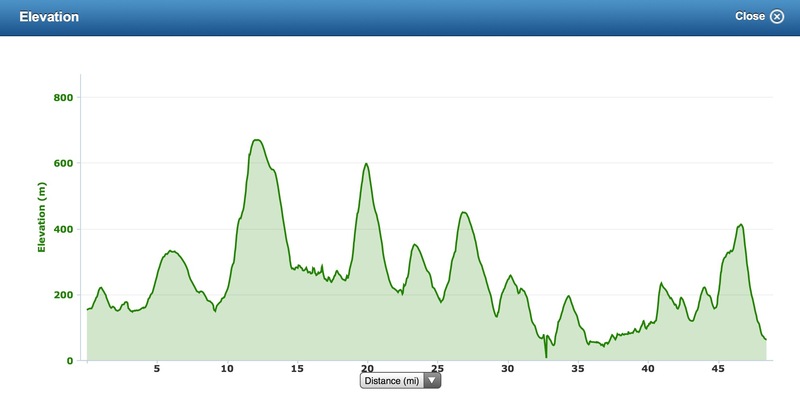 This is followed on Sunday with the Ambleside to Coniston leg covering some 14 or so miles. The recce misses out the required loop at Dalemain to make up the remaining miles come event day! With all that mileage and big ascents/descents you’d hope to see some big movements next week. One exception will be Glyn aka ‘Mandown’ who’s foot/ankle currently looks like that of an elephants following his badly ripped tendon at the weekend. Having been told today of no running for 4 weeks, which take us up 2 weeks prior to race day, he’ll be pushing things for the Lakeland 50! Given his athlete status, robolike physique and plenty of RICE i’m sure he’ll be back on his foot in no time! Stay tuned for more updates from ‘mandown’ himself and to see how we go at the biggest weekend of the year for the ultramadness team! Wwaahheeyy, he’s done it again!!!!! 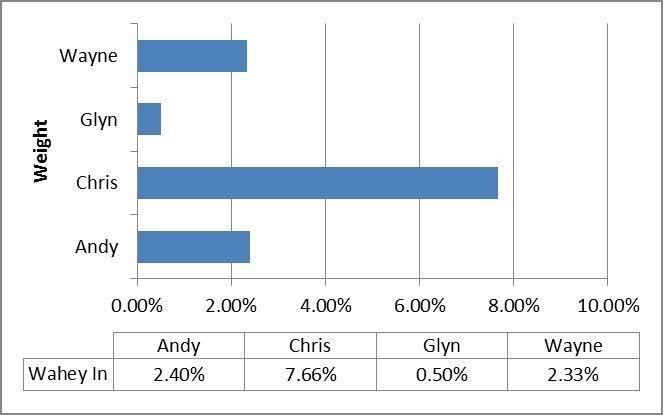 Well Chris has posted yet another tremendous loss and is simply leaving us trailing in his wake!! 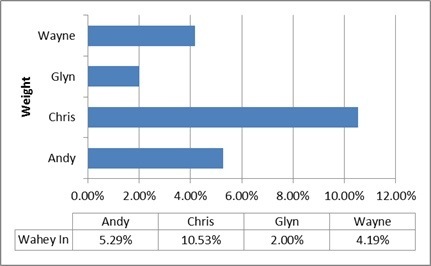 Chris is sitting on an amazing loss of nearly 12% since we began at the end of January. With only three weigh ins left is it all over???? No weigh…….2 up, 1 the same & 1 down!!!!!! Wow, well what a week! 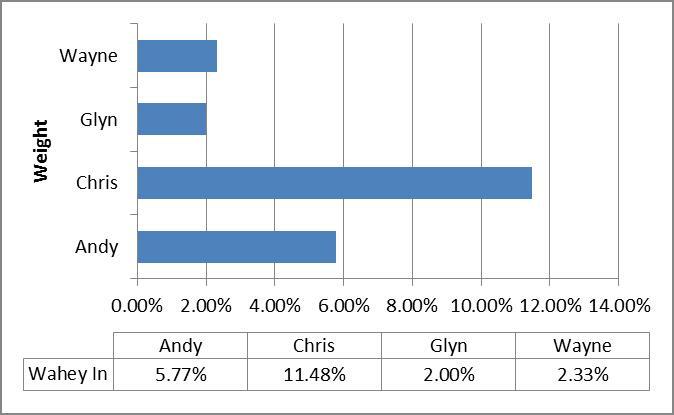 We’ve got 2 that gained (Wayne & Chris) one neither gained nor lost (Glyn) and one (me) lost this week so the gap closes again on Chadders who was ultra running away with it, or was he???? See the latest stats below….. So with the weeks counting down is it too little too late? Stay tuned for the latest, tho with a couple away over the half term it’ll be a full two weeks till the next weigh in!!! Well a bit of a Topsy Turvey week this week with one down, 2 up and 1 staying the same! 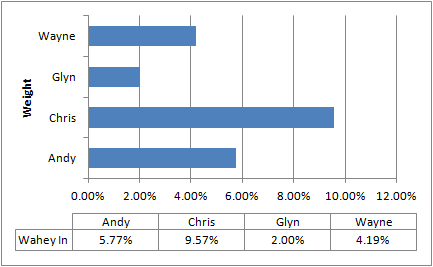 Chris has posted a loss making up on what he gained last week so maintains a pretty good lead into the last few weeks. Stay tuned folks, I feel a step up in training coming on to try and close the gaps…..
Weighting for the star to fall……..
…….and fall he did this week, but is it too late for us to catch him? Chris managed to undo all his hard work with a massive gain putting him back to where he was 3 weeks ago! Did you see his BBq pic??? I’ve maintained the status quo this week but the shining stars are the Cumbria boys both posting their biggest losses of the competition so far. Well done chaps! This week has shown that with the number of weigh-ins to the end of the competition reducing rapidly any significant gains could be capitalised on so be sure to subscribe by email for all the latest updates…. Look after the pennies and the lbs look after themselves……. However we’ve each done our Tuesday morning weigh in and its business as usual, well almost. Chadders continues to defy science and loses yet more!! With only 8 weigh-ins between now and the end of our competition it’s looking far less likely well catch him. Despite my disaster on Sunday I posted another good loss proving that running club and regularly powering round Park Run and smashing PB’s is having a great effect. Glyn, he’s also posted another steady loss this week, small but perfectly formed. 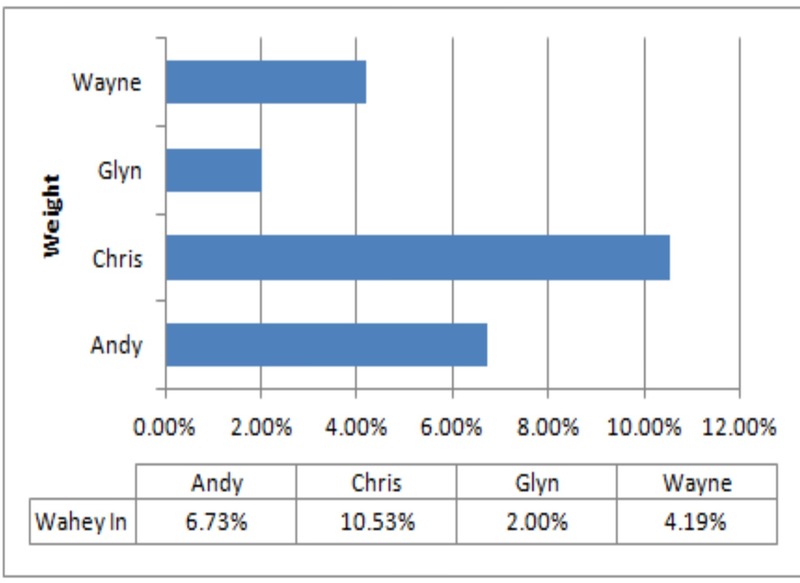 Wayne had a tinsy-winsy loss this week too but sadly not enough to effect the figures! 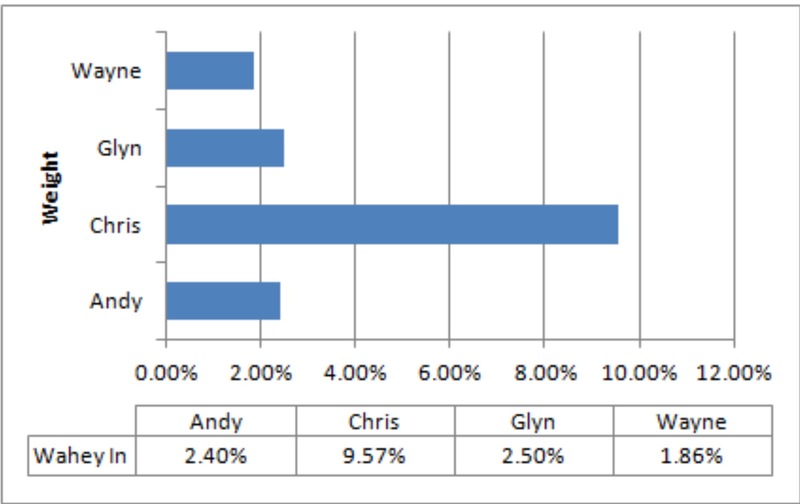 So overall the results stand like this…..
It’s a pretty amazing overall loss so far from Chris and very respectable from everyone else. Is he weigh-out in front this week……….nope! Well this week we may have seen a turning point in the comp with Chris posting a zero loss/gain and the rest of the guys all posting losses! Wayne and I posted a 2lb loss and Glyn just the one but with Chris staying the same it narrows the gap………a little. A couple or three weeks like this one over the remaining time until the end of the challenge and that gap could shorten further. To be kept up-to date on this and other news from the ultramadness team be sure to follow the blog by subscribing at the top of the page! Till next time, keep on running……. Well for this weeks eagerly anticipated weigh in it appears that lbs amongst the Ultramadness team are like corporate shares, they can go up as well as down! After what was an awesome recce at the weekend covering the Horton-in-Ribblesdale to Hawes section (more to follow) we were all keen to see the effects at today’s weigh in. Especially after Chris’s Ultra Fueling granola experiment! Well Chadders, hes a getting bit boring now, continues to steam ahead with an amazing 10% loss since we began the challenge and posts yet another loss this week. 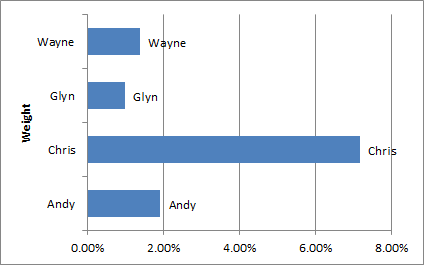 Wayne has maintained equilibrium this week and sits at an overall loss of 1.4% which has Glyn close behind, following a small gain, with an overall loss at a rounded 1%!!!! …….. so on we go to next week. Stay tuned to see if we can catch Chris or if he starts to slip back a little bit. Better still be sure to follow the blog by entering your email for all the updates as they are posted as we’ve some more recce’s, wild camps and a few races coming up. Worth weighting for………he’s still (quality) streets ahead!!!! Well apologies to those sitting on the edge of your seats yearning for the latest results of our weekly weigh-in. What with the Easter holidays and people being away etc it meant that we weren’t able to all weigh in at the same time. Anyway now were all back and the results are terrible!!!! Wayne and Glyn, despite valiant training’ish efforts, have gained a lb or two. Chadders, he’s maintained the equilibrium and posted a zero loss/gain. I on the other hand after two thirsty back to back weddings and a week indulging in Cream teas etc courtesy of Devon have posted a loss! Chadders is still (quality) streets ahead and hopes to maintain this thru to the finish. I’ve managed to open up a touch of daylight from Glyn and Wayne who are currently battling it out for the chocolate spoon! Keep watching as we’ve a few recces and events lined up over the coming weeks so things could start to close up! Weight for it…….weight for it…. ….well you’re going to have to as we’re having an Easter Break! A few of us are away and brought everything with us so no room for the scales. So no pressure next week when we’ll have a double weigh in! Happy Easter ya’ll and be sure to check in next week or better still sign up for updates. Well Chris has done it again posting another loss this week to put him way out in front. I’ve stayed static which is amazing given I had a large weekend socialising in London whereas both Glyn & Wayne both posting gains this week. Are we going to be able to catch Chadders before the end of June, be sure to follow us and the waheyin over the coming months……..
Whoa there, weight a minute……..
Appallingly this week sees three of us gain and only one post a loss. Well done Glyn, those early mornings are starting to pay off!!! You can see Chadders is still out in front but shows with the odd gain here and there he’s more than catch-able. 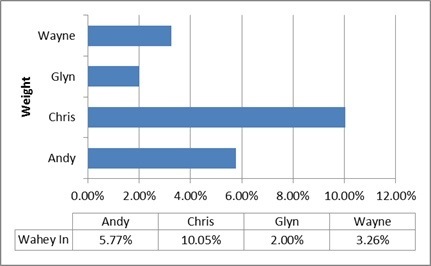 Well this weeks results are in and Chadders continues to power ahead with another excellent week with a huge loss. This cant continue……can it? Glyn continues to be slow and steady posting another loss, Wayne’s stalled a touch with a zero return this week and ive gone backwards with a positive return! So a real mixed bag of fortunes between us all with Chadders currently running away with it. Remember we’ve got until he 30th June to claw this back so weve a long way to go and with our 25+ mile run in the lakes this weekend coming up we should all be posting losses next week. That’s it, were all off the mark. Wayne has stayed the same and ive knocked another couple of points off too! See the chart below showing % lost against our starting weight. Be sure to sign up and follow our progress, and the blog for some interesting features that are planned over the coming weeks. Well, here we are on week 3 and the latest update for the weigh in! After id made a good start last week we’ve all been blown away by Chadders and his amazing ‘work hard, eat less’ regime losing just under 4% of his starting weight! Great effort. Wayne’s making good steady progress knocking a few lbs off followed by Glyn and his amazing start slow go slower approach! Be sure to check back for the latest next week & to see if Chris has actually wasted away to nowt or if Glyns ‘power bar’ diet has started to have an effect!